My daughter occasionally remembers Moscow and, although she likes it here, comes up with different things that she misses and reasons for us to go back there. This time it was pelmeni. So far I haven’t found them here. 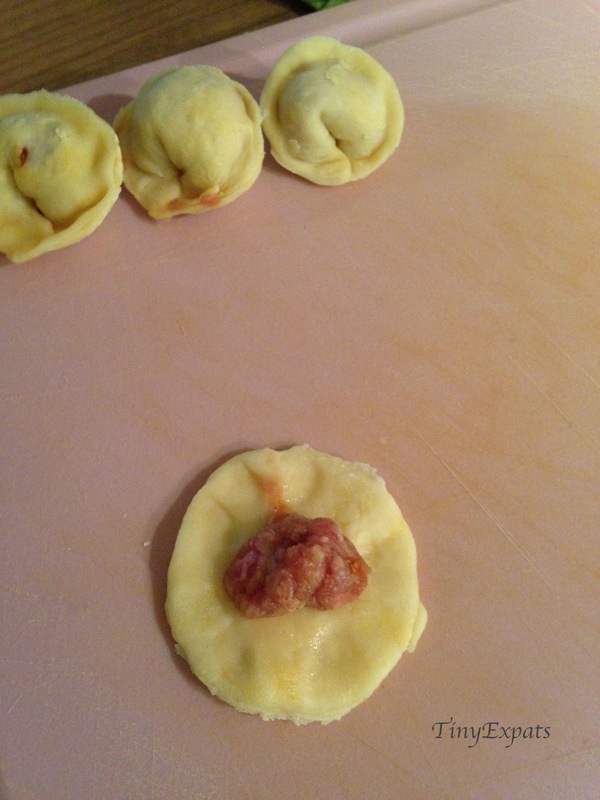 Of course, ravioli can be the closest choice, but it’s not the same. 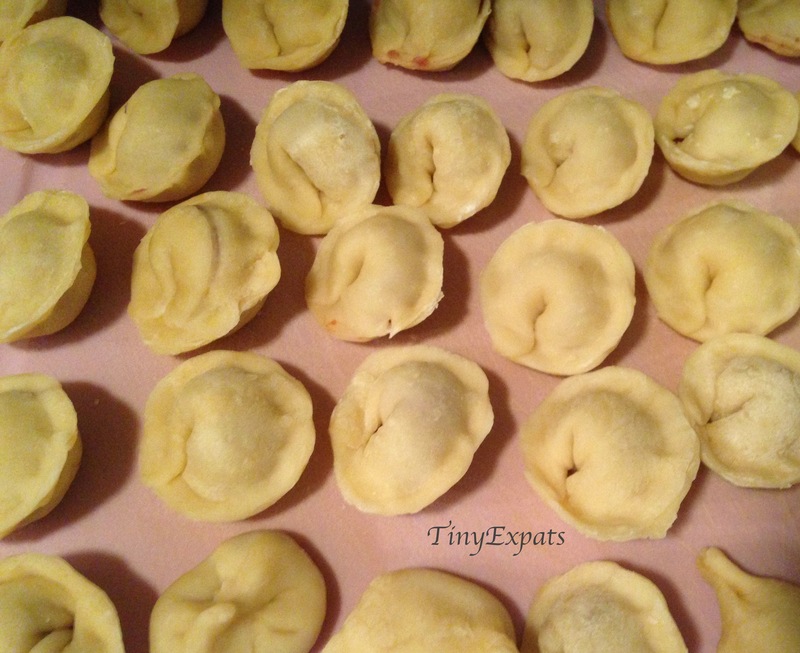 So I decided to save the day by cooking some home-made pelmeni. You might think that it’s not such a big deal, but for me, a culinary-impaired human being, it definitely felt like a heroic deed. Put flour and some salt into a bowl and mix in the eggs. Then start adding water gradually until you get a soft easily folded consistency. 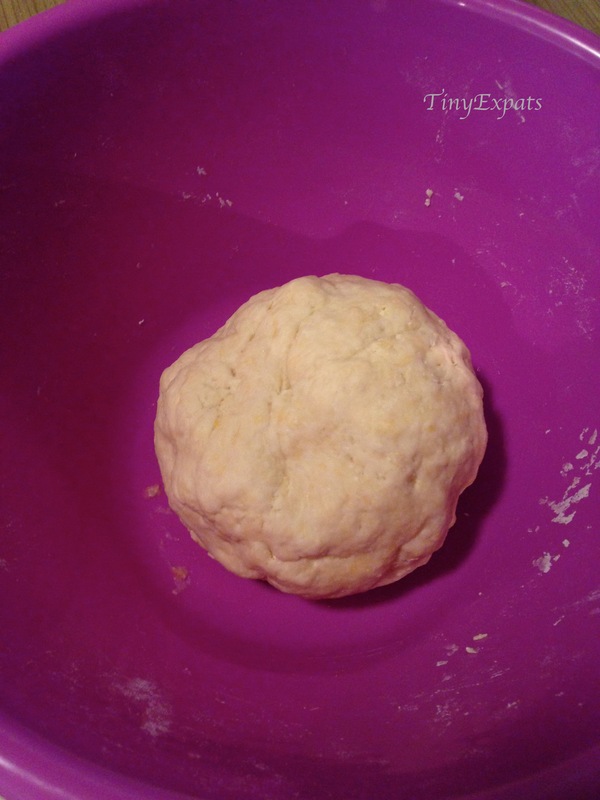 After the dough is ready, put it into the fridge for an hour. Now mix the meat with eggs, onion and spices. My daughter really hates finding pieces of onion in her food, but it does make it taste better, so I’m using a trick I recently learnt from a fellow expat in Pardubice (thanks, Öge!) – grating the onion! The pieces are so small then that it passes the ‘picky daughter test’. Let the mix sit in a fridge for a while as well. 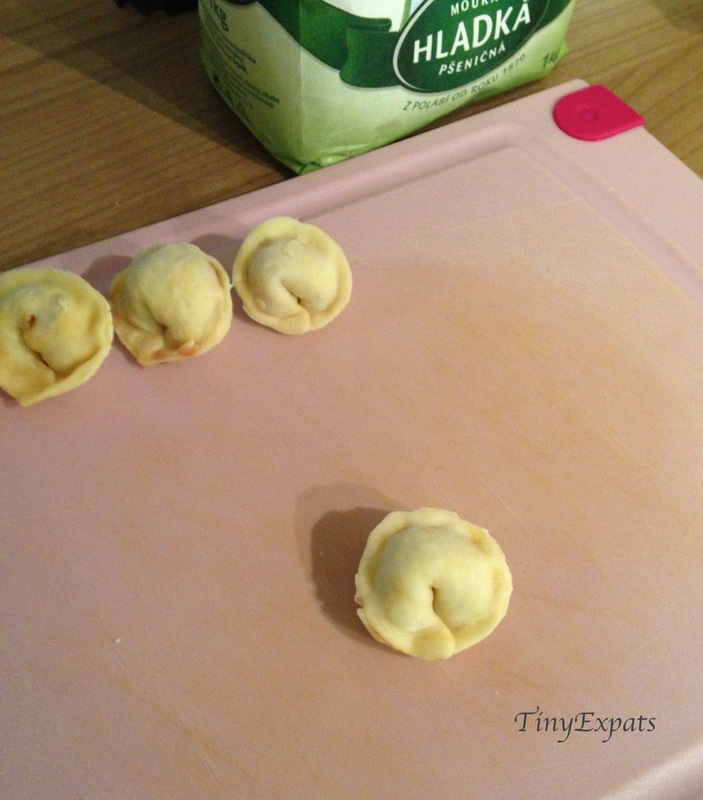 Now, when everything’s ready, let’s test our pelmeni-making skills! 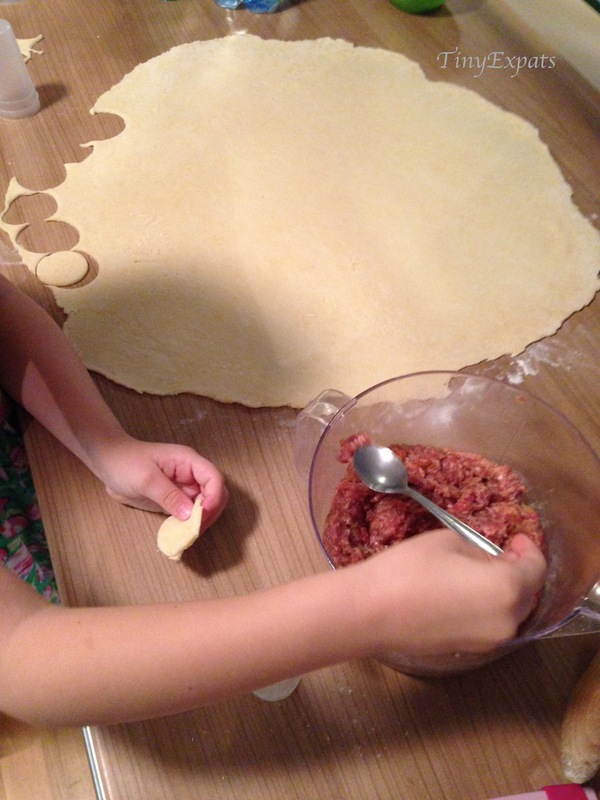 I rolled the dough in one big sheet, so my daughter could cut out the circles, but it would’ve been easier to roll it into several ‘sausages’, cut them into pieces and roll little pieces separately (I’m not quite sure I’m making sense to you at this point, but that’s why I’m not writing culinary books). Then it’s all a matter of putting some meat in and closing them up. Place them somewhere so they’re not touching each other and either boil straight away or freeze for later. You can make meatballs if you have left over meat or use left over dough to make some kind of breadies (roll it thin, cut out any shape, make a couple of cuts in the middle with a fork or knife and fry quickly on a hot pan). Homesickness 0 : TinyExpat 1. Until the next time she thinks of another thing to miss. 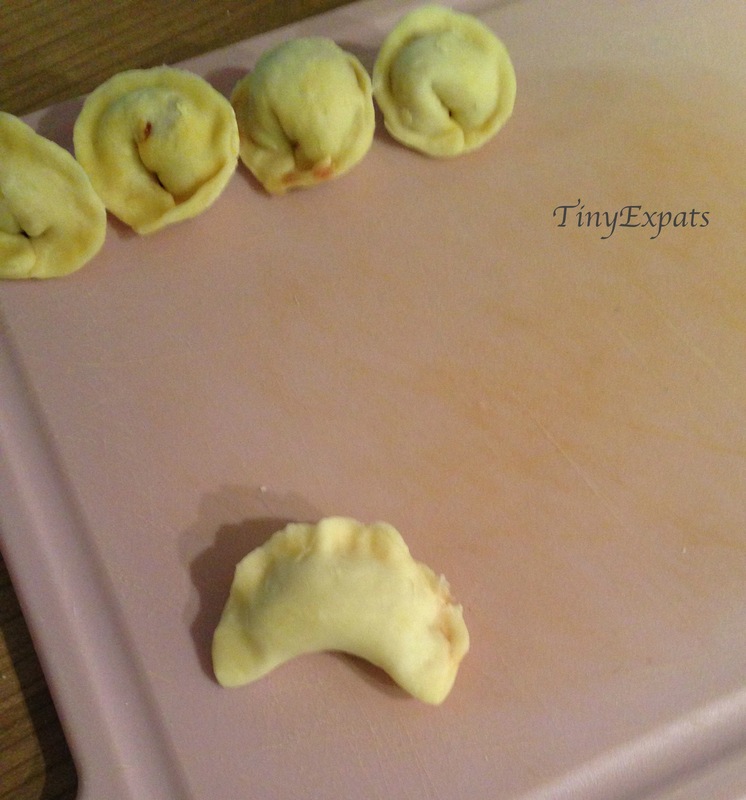 I’m in Moscow at the moment and one of the first things I did was make about 200 pelmeny with my grandma. It really made me feel like I was at home. Just putting together a culinary post myself too :) They look yum, might have to attempt that, been meaning to do more traditional food from this part of the world.